First up, a ready made Korma curry, which I served over rice and spinach. See the part on the box where it says mild? LIES! This was spicy and hurt my tummy. Thankfully this Falafel Mix was wonderful! 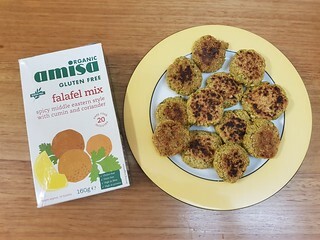 It was so easy to make (just mix with water and let sit), and made delicious falafels. Magically, they were not too dry (as I find a lot of pre-mix falafel or just store-bought falafel to be). I made some cute little falafel to serve with some salad and sauce in a bowl I made, but also made some into larger patties to make sandwiches with for work. 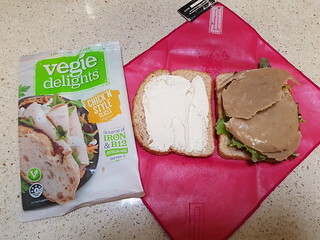 The Vegie Delights range reformulated to make all their products vegan a while ago, so I was excited to try these chicken slices on sandwiches. So much no. They came out of the package like a congealed puck, and I just had to tear it apart as the slices were stuck together. You can see in the photo how I had to rip them up. Plus they were dry, and didn't taste very nice. 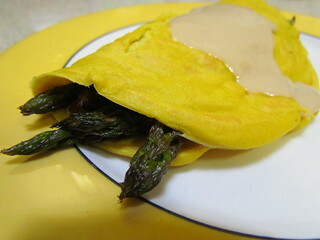 I'll stick to Tofurky and Field Roast slices for future sandwiches! 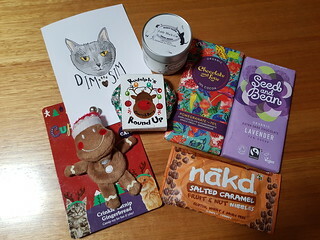 My lovely friend Emma and her kitty Sassy, both of whom I met on Instagram, sent me this wonderful care package and card for Christmas. Emma painted Dim Sim's portrait on the card herself, and it is now framed in my room. I was super excited about the Round Up, which I ate immediately. And everything else was lovely as well! I especially enjoyed the sweet tart flavour in the pomegranate chocolate. The candle smells like the most delicious lollies! 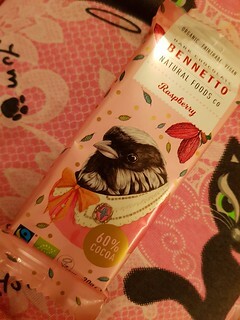 Bennetto is a relatively newish brand of vegan chocolate, made in New Zealand. I love this raspberry flavour, as it is packed full of little raspberry pieces. Not only delicious, it is also on the Food Empowerment Project Recommended Chocolate List, so no child slave labour was used in the making of one of my new favourite treats. What do I love? Silly drinks! When do I want to drink them? Whenever I find them! 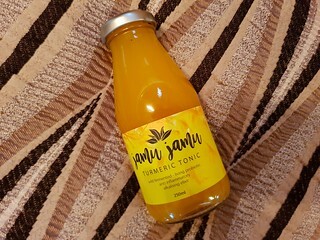 And such it was with this Turmeric Tonic. It was... very strong with the turmeric flavour. 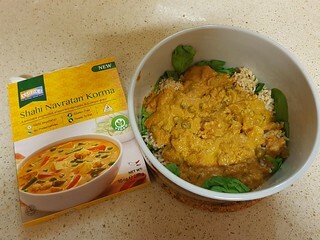 I like turmeric flavour, so that was good. But definitely would not be something everyone could drink. I suppose you could dilute it out with some coconut water. But I just wanted to drink it down! Why hello there! 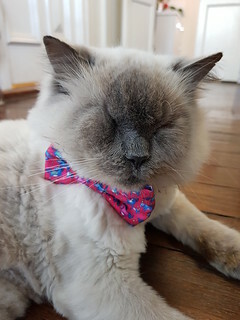 Jed looking very dapper in another bow tie. 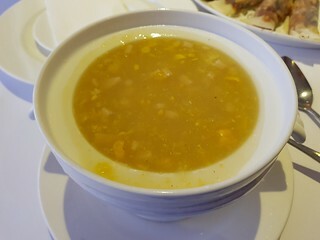 Keen to maximise the experience, I ordered some Peking Duck Pancakes and Sweet Corn and Chicken soup to start. 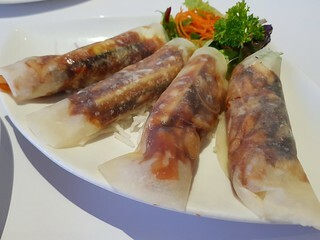 I love peking pancakes, and these were very nice. The soup came in what looked like a huge tureen, but ended up being a warmer with a smaller bowl on top. 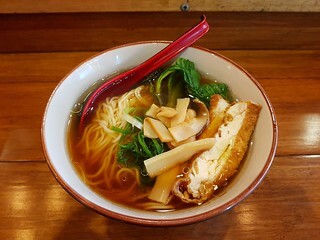 It took a while for it to cool down enough for me to eat it without scalding my tongue, but it was good soup. I was glad I ordered two starters. When my main came out, the Vegan Char Kway Teow, I couldn't eat it. It was unexpectedly so spicy and hurt so much. But thankfully my brother was able to eat it. 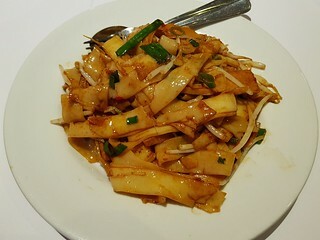 I have had Char Kway Teow at heaps of other places before, and it has never been spicy, so this was a shock! So I had some steamed rice and some of the greens in garlic sauce (not pictured) that we had ordered for my main. Ahhhh, just like the old days of being a vegan. 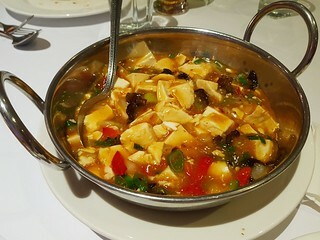 Speaking of spicy, my brother also ordered the Ma Po Tofu off the vegan menu, but I didn't try any because spicy! On their last night before going back to the UK, we ordered some Michael's to be delivered. 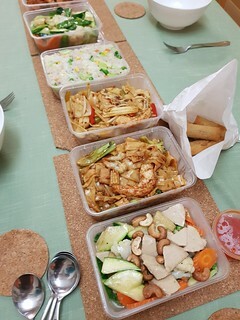 We ordered Cashew Chicken, Hokkien Noodles, Singapore Noodles (which my brother ordered with wide rice noodles), vegetables in garlic sauce, and vegan fried rice. Sadly, this was... not great. 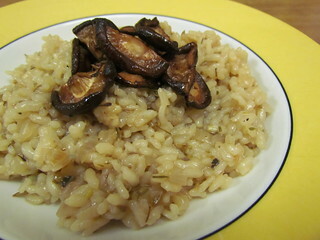 Very oily, not a lot of flavour, the vegetables were so overcooked they were just mush. Needless to say, it has kind of turned me off from ordering from there again. 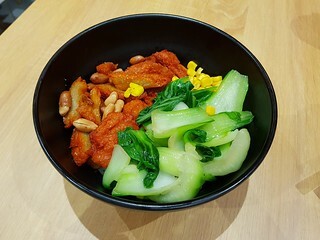 I have tried most of the things on the vegan menu I can, they have heaps and heaps of spicy dishes I can't eat. Oh well. It is there in a pinch! And a lot of other people like it, I assume they can eat the spicy things, so my opinion may be skewed. Plus I did like it the first time we ordered from there, so who knows. Perhaps a bad day. Food may sometimes be disappointing, but Jed never is. 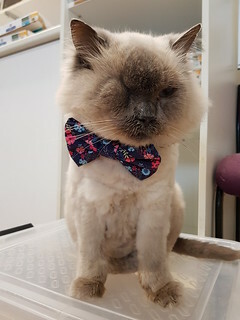 Check him out looking smart in his bow tie! 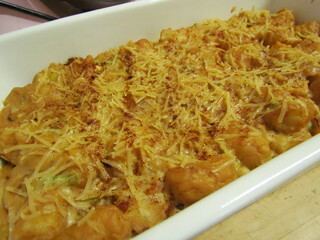 Several years ago, I tested for Vegan Casseroles a casserole inspired cookbook by Julie Hasson. 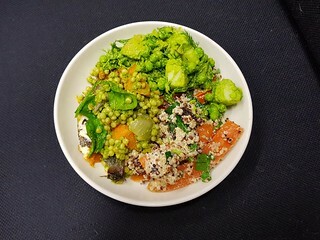 Even though I made a heap of recipes during the testing process, I realised I haven't actually done a round up post for it yet! 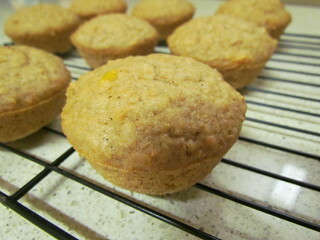 In fact, I have only shared a review of one recipe here as part of a MoFo prompt. To rectify, here is my first round up post for it! The book is divided into different types of casseroles: appetiser casseroles, dutch-oven and skillet (aka stove top) casseroles, old favourites, pasta casseroles, vegetable casseroles, dessert casseroles, and a chapter for sauces, toppings, and basics. Please enjoy some of the things I have made! 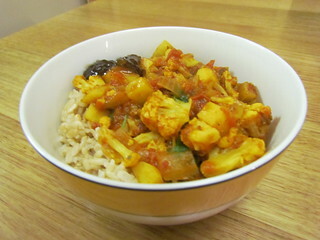 Aloo Gobi: This is a stove top casserole, and very easy to make. Cauliflower, potato, and onion are simmered with spices and tomatoes (the recipe says to use one cup of tinned tomatoes, I just used a whole tin and it was all good). 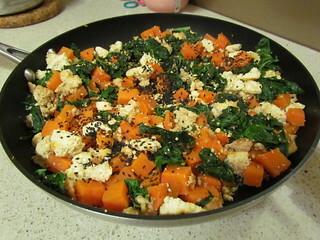 I left out the jalapenos from this, and served over brown rice and spinach with some chutney. 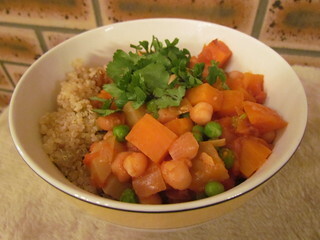 Moroccan Vegetable Stew: Another one made on the stove, this was delicious with a lot of fabulous flavours. Carrot, sweet potato, turnip, tomatoes, zucchini, chickpeas, quinoa, and raisins make this a full meal. And a big one, I got six serves out of this. This was Dad approved! I also added some frozen peas to the mix, because why not? Baby Greens with Cashew Cream Sauce: Creamed greens are not something I grew up with, but are something I have come to enjoy thanks to my cookbooks. I made this one Christmas, and it was a nice addition to the table. This falls under a stove top casserole, though is one of the least casserole like things, but it is still tasty! The sauce is rich and lovely. 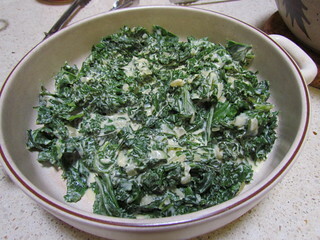 I used kale for my greens, but I couldn't find baby kale, it just needed a bit longer to cook down but was lovely. Nacho Tots Casserole: Everything about this recipe title sounds great, right? And it is! Thawed potato gems/tater tots are mixed with a Nacho Cheesy Sauce (another one from the sauces chapter) plus some other stuff, then baked and loaded with whatever your heart desires. I topped mine with a bit of cheese as well before baking, and then loaded them up with avocado, tomato, and bacon bits for serving. Creamy Rice and Dill Casserole: This requires a couple of pre-made recipes from the sauces and extras chapters: The white wine variation of a cashew-based Almost Alfredo Sauce, and some Chicken-Style Soy Curls. Thanks to my US stash of soy curls, I could do this without subs. 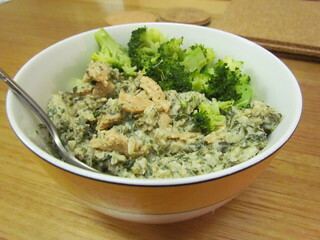 Cooked rice is mixed with the above, as well as with spinach, lemon, and dill. I added extra dill, as is my desire. Served with some steamed broccoli. Bean and Rice Casserole with Salsa Fresca: Another batch of the Nacho Cheesy Sauce, mixed with some cooked rice, and tinned pinto beans. 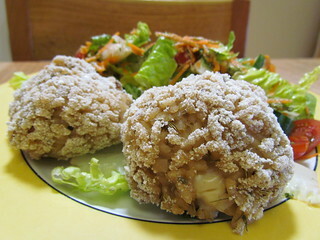 This recipe was so quick and easy to make. 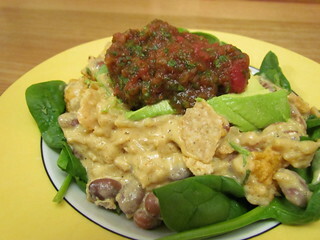 It is topped with some crushed tortilla chips, but would also make a great nacho topping in reverse! It is topped with some homemade Salsa Fresca, which uses tinned tomatoes (fire roasted if you have them) mixed with coriander, lime juice, and smoked paprika. I left out the jalapeno, and also just used a very small amount of onion in it as well. It was a great fresh addition to the casserole. I also added some avocado on top as well. Remember Jed? Well, get ready for some fashion shoot material. 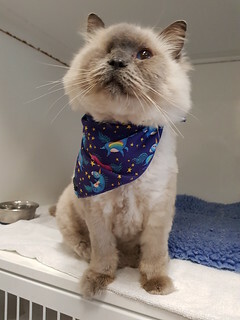 How suave does he look in this little bandana? 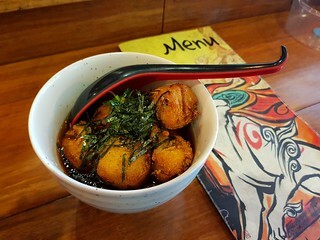 This post is a mish mash of a few individual little meals I have had out at a few different places on my own, so I thought I would just share them together. 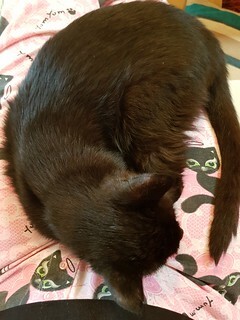 A perfect little cat on my lap. Earlier this year, my brother and his girlfriend were visiting from the UK. On their last morning, I took them for brunch at my beloved Flora. This is now the only Flora, the one at the Gold Coast has closed. Which is sad for the Gold Coast, but I am very happy it is thriving here in Brisbane where I can visit! You can see those previous visits here. 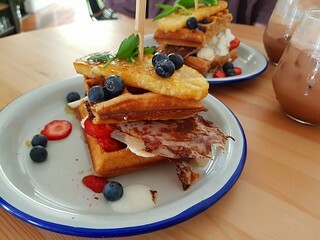 They both ordered the Waffle Stack, which had waffles, hash brown, rice paper bacon, ice cream, and berries. Enjoyed by both of them! I got the Avocado Toast with a hash brown and a vegan egg. What is the egg made of? I have no idea! I think tofu or some sort? But it is fun, without being super eggy. 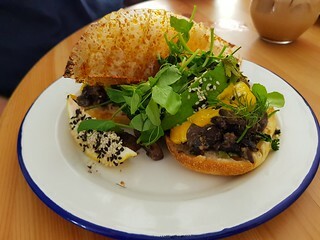 I know avocado toast is the roll your eyes standard cafe offering for vegans, but I also know that avocado toast is great. This one had almond feta and herbs and was served on a delicious sourdough. 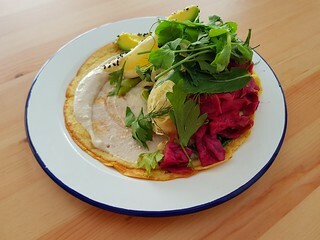 Another lunch I had there was their Chickpea Crepe, which is topped with sesame green, broccoli, cauliflower, pickled cabbage, and kraut. 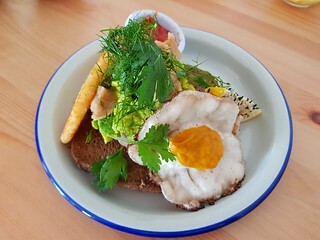 It also came with some avocado. Tasty and filling, yet not too filling. I met up with some friends for lunch another day. It was hot, so we each had an iced drink. 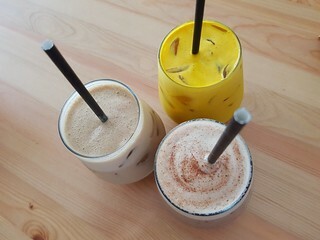 I had the iced cacao (yummy), Ashleigh had the iced tumeric, and Cam had the iced chai. They ordered a Mushroom Benefict. 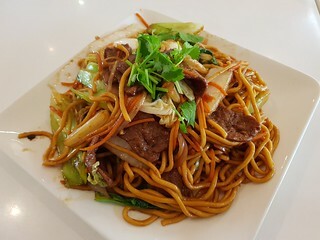 This was what I ordered the very first time I came! Presentation seems to vary depending on the day, and this one was very pretty, so have another photo of one. And I had... the Waffle Stack! Because I found out at my last visit that they use beautiful wonderful soy ice cream instead of yucky coconut ice cream. I was SO HAPPY! And this was awesome. 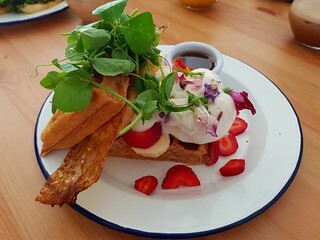 The waffles are not too sweet, which is perfect with the ice cream and berries and syrup. 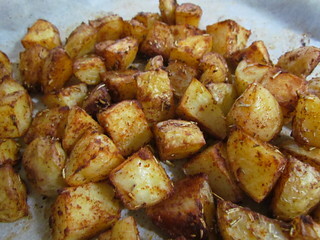 Plus some rice paper bacon for smoky crunch and the hashbrown because you always need potatoes. I recommend! 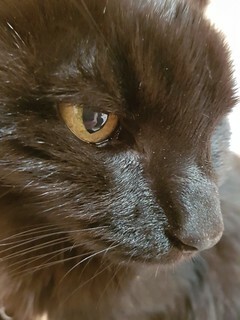 This perfect girl had to go to the clinic the other day, but just for a routine blood test. 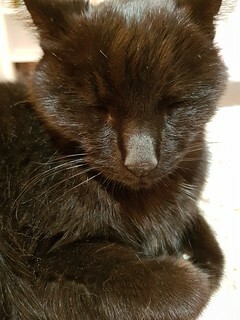 Her thyroid is getting a little bit high again, so we need to fiddle with her thyroid meds a bit more. She is already on such a finicky, tiny little dose that we have to make the teeniest adjustments to. Seems fitting for such a tiny baby! But her kidney disease is stable and everything else checked out OK. This is a vintage edition of Midweek Munchies. In that I found a random folder on my computer that was of random photos taken earlier last year. They might have been lost forever, but I stumbled across them and now I share them with you! I also realise that almost all of these were work-related foods! These Chocolate Cinnamon cookies are both vegan and gluten free. 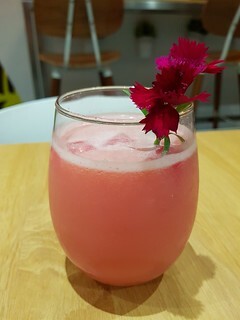 I am not sure who makes them, but they are available at a few cafes around Brisbane. My friend brought me one of these when I was having a rough time at work. They are very delicious. 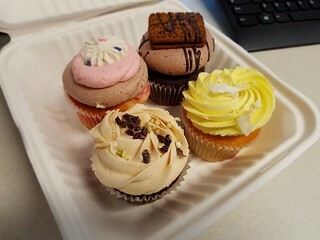 For a work birthday, we got some vegan Little Prague cupcakes to share between us. Flavours included Neopolitan, Chocolate Creme, Passionfruit Raspberry, and Chocolate Peanut Butter. 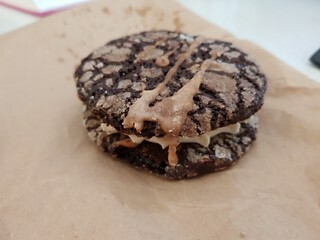 And another time, we got some treats made by Little Vegan & Co. 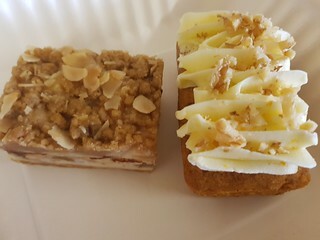 Including a carrot cake, and their apple crumble cheesecake slice aka one of the best things I have ever eaten. Finally, one day at work we had a rep coming and they were bringing lunch. We asked them to bring Botanica, which they did, and I had this big delicious plate of assorted salads for lunch. Remember teeny Olivia, the kitten who was dumped in a letter box? Well here she is now. Simultaneously still teeny, but also such a big girl! She has grown so much. 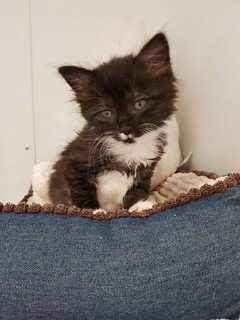 She is now eating, drinking, and toileting on her own and will be going to her new family soon.